According to PMI there are 6 project constraints in PMBOK 5th edition which is a potential question in the PMP certification exam: Scope, Quality, Schedule, Budget, Resources, and Risks. If you are a project manager preparing for PMP certification (Project Management Professional certification) by PMI, you should be able to identify the project constraints and select the one that is among the project constraints or which is not a constraint of a project listed in PMBOK. It is very common that you will be asked to answer such a question "Which one of the below items is not one of the constraints of a project?". Here is the list of project constraints listed in PMBOK 5th Edition (Project Management Body of Knowledge) at page 6 within the topic "1.3 What is Project Management?" As a project manager or as a lead of project managers, you have to deal with project constraints and balance these factors. From the Scope-Time-Cost-Quality relationship, project managers will understand the first 4 project constraints why they are listen in PMBOK for PMP. Resources can also be easily accepted as a resource. 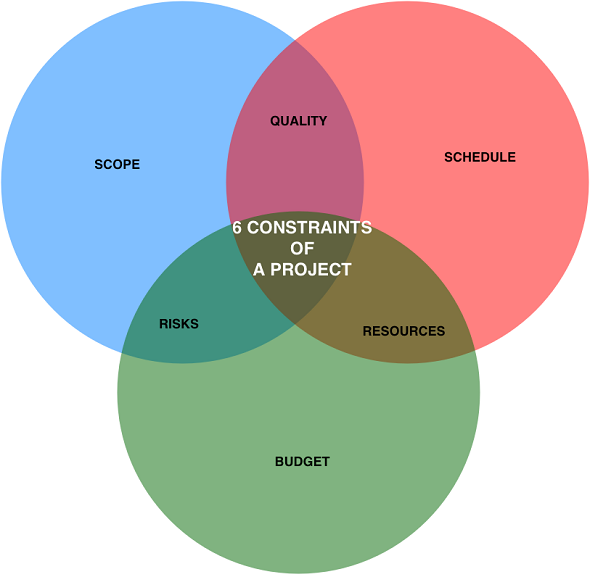 What is the most interesting item in the project constraints list is the Risks. But project managers shape the management plans of their project processes by considering the risks. The scope can be altered to avoid a risk, or the budget will be increased for known unknowns or for the unknown unknowns as project management contingency, etc. So with this approach in mind, a project manager can treat the risks as the project constraints as well.